Beer Rating System — Two Old Guys Drinking Beer! How Would You Rate Your Beer? Our rating scale - bottle caps! bottle caps! So, most of us who drink beer generally have an idea of what we like. Some of us like a dark, very stout beer. Others prefer more light fare, such as an IPA or a Pilsner. 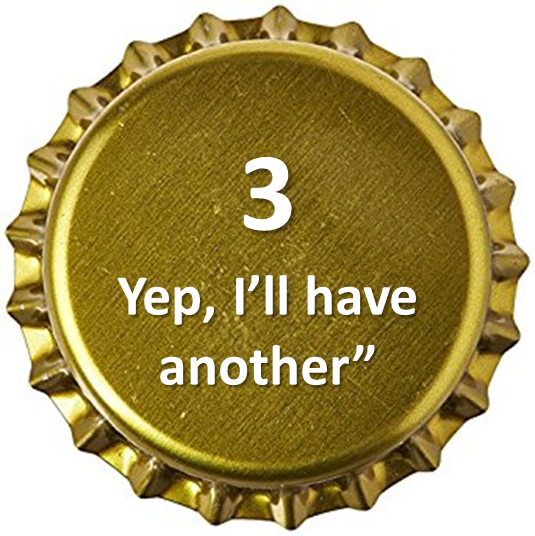 We can all probably rack and stack the beers we have experienced in some sort of rating system. Well, here at Two Old Guys Drinking Beer, Bill and I have come up with a numerical rating on the beer. Ranging from 1 Bottle Cap (absolutely the worst), to 5 Bottle Caps, (absolutely the best), we'll give our opinions on those beers we partake of during the podcasts. Now, we don't have the scientists in the back of the room measuring hop, barley or malt content. We don't have a Brew Master on the payroll. We just know what we like. However, given our advanced age and experience in imbibing the lovely liquid, we can honestly say we know a thing or two about said beverage. As Benjamin Franklin is alleged to have said: "Beer is proof that God loves us and wants us to be happy". Here, here Ben, if you were around today we'd invite you to join us.